Good afternoon peoples. First let me express holiday greetings to everyone and wish everyone a Merry Christmas and a Happy and Healthy New Years. I know its been a while since i've been here. A lot of things have been going on, mostly not for the better, but im still here and still breathing lol. So, heres what happened and what i need to know. Yesterday my starter solenoid fuse burned out, so i did a "quick fix" using aluminum foil and it worked for about 5 blocks, and shut off again due to the solenoid wiring got so hot it melted the top plastic piece on the solenoid and all the wires came off and my bike shut off in the middle of the road in evening rush hour traffic. Well, the police showed up and blocked all the traffic until the flatbed wrecker came to tow me home, which to my dismay I found out that my bike wasn't covered with "roadside assistance" and i had to pay out of pocket for the tow. Anyway, I had a spare solenoid and put it onto the bike a few hours ago, and after trying to figure out which wires go where, I have no power with the ignition switch turned to "on". When i "jumped" the solenoid, all the dash lights came on and i was able to get the engine to crank, but still no power to the ignition switch. My question is this....does anyone have the wire color code and placement of the wires on the solenoid switch? Oh, and BTW, i found out why my radio wasn't putting out any sound. It was the "din plug" under the command center that somehow got unplugged. You will need to figure out which is which especially if it's not an OEM part. There will be 2 terminals which are hot, the red wires go to those, the other 2 wires go to the other 2 terminals, doesn't matter which. Be sure also the battery and starter cables are connected to the right posts, the battery goes to the one marked B, starter to the one marked M.
until the flatbed I found out that my bike wasn't covered with "roadside assistance" and i had to pay out of pocket for the tow. Suggest you contact Good Sam, been with them for decades, and can't find a better plan anywhere. No miles limit on the Tow. Hi Dave, thanks for the info. After trying to put the wires on their correct pins, I was able to get the bike to fire up, but now I can't shut it down with the key even after i switch it to "off" and remove the key. It keeps on running, so I had to pull all the wires off again plus take the 30A fuse off the solenoid, so now I'm right back where i started from. The B cable and the M cable are on correctly. With respect to the wires, someone has spliced into them not using the right color wires, so, its anybodies guess as to which wires belong to what end pin and which are the hot wires. The solenoid is an eBay replacement and NOT OEM. I can only guess at this point because while i have the key turned to start, the electronic fuel pump isn't kicking in and all the dash lights come on weather i have the key turned on or off. How do i determine which are the hot posts on the solenoid? Last edited by roadwanderer2 on Fri Dec 21, 2018 6:09 pm, edited 1 time in total. Hi AZgl. I've been in contact with my bike insurance company, and they told me that if i want to add "roadside assistance" I would also have to get coll and comp, So as of next month, im switching to a different insurance company where i don't have to get all that other crap to get roadside assistance. 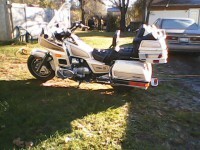 I have Progressive for my truck and motorhome, so im gonna add my bike to my policy. Its MUCH cheaper than the insurance I have on it now. The green/red wire goes to the clutch diode at the rear of the bike, grounding the starter switch circuit. There is a 30 amp circuit connected to the starter solenoid "B" terminal for the 30 amp CFI circuit. You mention there are wires spiced into these wires. Which ones are affected? Well hello Earnest. Good to hear that YOU'R also among us lol. The photo you posted is exactly what i needed to find. Maybe now i can figure out which wire goes where. Someone spliced into ALL the 4 wires, so i'll have to remove the seat and trace up from the solenoid to find the original color coded wires. Maybe that way i'll be able to RE-splice the correct color wires and put them in their respective pins on the solenoid. Have a Merry Christmas and a Happy, Safe and Healthy New Years. Stuart - going to be around until the Maple Leafs win the Stanley Cup again, still remember watching the '67 win. Have my '85 LTD apart for work. Have had the heads refurbished, doing a shockingly nice job on the additional wiring I've installed - using TESA cloth tape instead of the usual vinyl electrical tape - highly recommended even the less expensive over seas type. Need to replace the dash lights - have two out, cleaning/polishing the valve covers - lots of elbow grease required but look good, and a few other items. 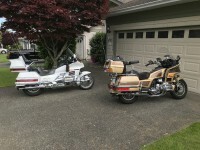 Have a 1500 that I ride, nice bike, nice ride, but do miss the sportiness of the 1200. Merry Christmas and have a safe and happy New Year. Hi Ernest, sounds like your doing some serious work on that bike. Today i was able to get to the wiring under the seat and heres what i found......... Other than being a "rats nest" of wires, the wire that looks red and white is actually a white wire with a red insulator covering it, 1 pair of yellow/red stripe, and 1 red/white stripe with 1 solid red connected to it, and one grn/red stripe. Now, when i connected them to their proper pins on the solenoid as shown in the photo you sent me, I still got no sound from my electric fuel pump, but the engine did crank when i pressed the starter button with the key on AND off and all my dash lights lit up. I can't make heads or tails from this thing lol. Follow the white wire back to its origin. It should be connected to the "B" terminal of the starter solenoid. The red and red/white wire should be connected together but not under the seat. Follow the red/white wire forward in the wiring harness and when you get directly below the gas fill, you should find the red and red/white wires connected with an OEM connection. This is where the red/white wire from the RR joins the red wire going to the ignition switch. It is from this connection that the red wire goes forward to your ignition switch, and a red and red/white wire goes to the starter solenoid. Nothing should be spliced into the yellow/red wire because it is only live when you press the starter button. The green/red wire is the ground wire from the starter solenoid back to the clutch diode and then to ground completing the circuit. Make sure you have power to the CFI circuit, fuse #9. If not, the CFI circuit is not being energized. This is the 30 amp fuse circuit from the "B" terminal of the starter solenoid. Hi Ernest. OK, i got some good news and some bad news lol. The GOOD news is i get the bike to start, and BTW, the white wire is the only wire that has a 30A inline fuse attached to it. The BAD news is I can't get the bike to shut off with the ignition switch. I have to remove the fuse thats on the solenoid to make the bike shut off, BUT, while i have the key on, all my lights and radio work, and when i turn the key to "off" only the dash lights and radio shut off and the bike keeps running until i remove the solenoid fuse. Only then will the bike completely shut off. Is it possible that i have the grn/red and the yel/red wires backwards? Lets not forget that this solenoid is a NON OEM replacement so COULD it be a "mirror image" part and the wires are reversed?. Oh and one more thing i just noticed, I accidentally touched one of the 3 yellow wire connectors that come from the stator and they are getting hot and my on board volt meter is showing 11.3 volts at an idle. Does it matter which of the 3 yellow wires are connected to any of the 3 connections? Right now i have my battery on the "tender" and its charging up. Stuart - you've been riding this bike for a while, and now this has surfaced. Something has changed. The green/red and yellow/red wires are interchangeable. You can try to reverse but should make no difference. If there was power still going through the yellow/red wire the starter would be engaged continuously. To determine the exact pin placement, you have the battery connected to the starter solenoid on the "B" terminal - you mentioned this. With the 30 amp fuse in there should be two pin terminals live and two that are not. The two that are live are for the red and red/white wires, doesn't matter which goes where. The other two are for the internal coil that is energized when you press the starter button. The white wire powers the CFI circuit, need it to operate the bike. Does the engine stop using the stop (kill) switch? You mentioned that you have wire(s) spliced with the yellow/red striped wire, where is the spliced wire going to or coming from. The yellow/red wire is connected to a brown wire. Where is the brown wire from or going to? You mention that the engine stops when you remove the starter solenoid fuse, and you mention that the red wire has a wire joined to it. Where is this joined wire connected to? The only way that the engine can stay running is for the ignition switch to be bypassed somehow. Only one power wire, the red one, connected to the ignition switch. The yellow stator wires can be connected whichever way, no sequence to them. What is the system voltage when you increase the engine RPMs? What I would recommend is to find the red, red/white, yellow/red, and green/red wires and remove any wires attached to these. Take pictures and label the wires for reference - which ones were joined together. You may have to go further into the wiring harness to do this, but it's necessary. Locate the junction of the red and red/white wires where these are first joined together, as per my other post just below the gas cap fill. Also locate the yellow/red wire that will be close to this as well. The green/red wire goes towards the rear where the clutch diode is located. Then connect to the starter solenoid and find out what happens. Ernest, I'm gonna give you the "digested" version here......A year ago my wife and i split up, so i packed up my p/u truck with my wing inside the bed and moved here to Tucson Arizona and now living in a small class C RV. My bike has been sitting on my truck for the past 8 months without being ridden but started up at least once a week. I finally got some help to get it off my truck so i could start riding it again and its been running perfectly until this problem started when my solenoid switch fuse burned out and i tried to do a "make-shift" fuse by using aluminum foil to get me to the parts store to get a replacement 30A fuse, but didn't make it. The bike again shut off in the middle of a turn lane, but when it did shut down, i saw that the plastic top where the 4 wires connect was melted and the wires came off. Thats when I had to call a flatbed to tow me back to where my RV is parked. I can't do anything now because its dark outside and I don't have a garage or outside lights or any inside area to do any work, so it'll have to wait until tomorrow to do any more wire hunting. Once i do that, i'll be able to give you more information as to what wires are what and where they are located as to answer your questions about them. I had to replace the battery and bought a cheaper one, thats when i first noticed the dip in the voltage. Before i replaced my old battery, my volt meter was at 12.3 at idle and went up to 13.7 @ 2500 RPM. Did I make a mistake by buying a cheaper battery? Unplug the regulator/rectifier, it may be internally shorted keeping power on the black wire which in turn keeps the ignition powered up. It doesn't matter which of the yellow/red and green/red wires are on which terminal of the 2 solenoid terminals. Quote "Unplug the regulator/rectifier, it may be internally shorted keeping power on the black wire which in turn keeps the ignition powered up. It doesn't matter which of the yellow/red and green/red wires are on which terminal of the 2 solenoid terminals". Hi Dave. I wish i could unplug the r/r, but due to a short in some of the wires and because they were wired together by the PO with wire caps, all of caps have been removed and all of the wires have been hard soldered, heatshrinked and bundled together by an electrician in Alabama over 3 years ago. I have no way to separate them unless i cut them apart. Tomorrow i'll remove the tank shelter and take a few photos and post them here. Stuart - looked at the troubleshooting manual and the supplement, and Dave0430 has a good point if the RR is shorted inside. The black/green wire is the RR sense wire and gets the electrical system voltage from fuse 5 which is for the ignition. When you take the shelter off, you can cut the black/green sense wire and determine if that is the culprit. You can always reconnect. The battery should not make a difference, especially if it's new. You can take it to a battery shop and have it load tested to determine the condition of the battery, should be okay. The starter solenoid fuse can fail because of excess current from the battery to the electrical system, or from the electrical system back through the red and red/white wires - the fuse will fail either way from excess current. If the bike was being rode when the starter solenoid fuse failed, I would hazard a guess the starter solenoid fuse failed because of excess current being fed back to the starter solenoid. This would further support what Dave0430 has mentioned. With the wiring the way it is, it might have been the catalyst for what has occurred. It just took some time to manifest itself. You will have to investigate and correct the wiring situation. You may also want to do an AC voltage test of the stator as well to confirm the condition of the stator. Disconnect the black/green sense wire first, then do a stator check - have to disconnect the stator wires from the RR - cut these then reconnect if stator proves good. Good morning Dave and Ernest. Here is what I found after i removed the tank shelter. the white wire with the inline fuse that connects to one of the solenoid pins is actually for the electric fuel pump which turns on and off with the run switch and is buried deep inside the wire harness and I cant get to it. The other photo is of the 3 stator wires that have male and female connectors. The other photo are the wires that are coming out of the R/R. the photo with the square piece is the fuel pump relay which when I put the fuse into the solenoid clicks and is working, but will only disengage when i either turn the run switch off or pull the fuse out of the solenoid. The last photo is of the wires coming out from the fuse block going into the wire harnesses. Now, once i put the solenoid fuse in, it has power, then i can put the run switch to "run" and the fuel pump will kick in and I can fire the bike up, BUT I can do this with the key "off" OR "on", and I CAN` shut the bike off with the "run" switch, but only when I remove the solenoid fuse will the bike have absolutely no power draw. The ignition key will NOT shut the bike off, but WILL shut down the radio and all my dash lights. I just had a curious thought...Could all this trouble be caused by a faulty ignition switch? OK, as for the ignition switch being the culprit, now it shouldn't be the case because when I unplugged it, I could still start the bike up by putting the run switch to "on" when i install the solenoid fuse. When i go to shut the bike off with the key, it would shut off all the dash lights, LCD readouts and my radio and I have to turn the "run" switch to "off" in order to shut the bike off, but the solenoid still stays energized until i remove the fuse. I traced all the available wires and nothing seems to be out of "normal", no breaks in the coverings, no broken, frayed, burnt or bare wires showing. I also disconnected the wire harnesses connected to the fuse block and that didn't make any difference. I can't do any testing because i can't find my volt meter. Is there any one of you guys that live in the Tucson Arizona area that would be willing to come over and help me out with this? I realize the holidays are coming up in a couple of days, and i'm willing to wait until after the new year. In the mean time, I wish everyone a Merry Christmas and a Happy and Healthy New Year. Hi guys and girls. Hope everyone had a nice Christmas and a Happy and Safe New Years. To Dave and Ernest. today i removed all the tape thats covering all the wires leading to and from the RR, and heres what i found. There is 1 black wire coming from the RR which is connected to a blk/grn wire that goes back into the main wire harness. I cut that wire and can turn the bike on and off from the ignition key with the wire UNCONNECTED, but the solenoid still stays energized until i remove the fuse. With the wires connected, i can NOT turn the bike off with the key. I pulled the fuses out of # 5 in the fuse block and the bike would crank, but the fuel pump would not turn on. I then pulled the fuse out of # 9 which then stopped power going to the bike. One thing i found very interesting. while i was "fidgeting" with the wires near the RR, i heard a clicking sound which sounded like there was power being connected somewhere, so removed the RR off of its bracket, and the clicking sound stopped. When i turned the RR around to look at the back side of it, I found a crack in the black casing about 2 inches long, and found what looks like blue-ish white discolorations on the center top and bottom of the RR bracket. Below are photos of the blk/grn wires coming and going from the RR, and the other photo is of all the wires that are hard wired to the RR and going back into the wiring harness, the back side of the RR and the RR bracket. Is it possible that all this trouble is coming from a shorted out RR?. Is it possible that's why I suggested you disconnect it? OK, im going to purchase a new RR and try to wire it in. Thanks for your input and help with this problem people. He did this just the past year. The black/green wire that disappears into the wiring harness is the sense wire from the electrical system. It connects to the RR only. It is also at the end of a circuit that provides power to other electrical components. Hi Ernest. I like the new style RR, but how would i go about wiring in all the existing wires into it, also, the OEM RR, from what i've seen, has 2 wire harness connectors whereas mine only has one main connector, which has been removed and all the wires coming from the RR have been "hard soldered" into eachother. In this case how would i know what wires go where into the new RR?. Stuart - The original OEM RR had two connectors. Yours has been changed and hard soldered which is the reason for the lack of connectors. I still have the original OEM RR off my '85 LTD and it specs out good. I would send it but the newer ones with the MOSFET technology are much better, and the price of the unit I gave the web site for is quite good - would cost at least this for me to ship to the US. The unit at the web site I posted has the connectors necessary to hookup the unit. The gray connection is for the stator wiring, and as per soldering, doesn't matter which yellow wire is connected to which terminal. The black connector is the positive/negative connection - should be denoted on the unit or in the install instructions. You can hook the positive up to the red white wires, and the ground to the green wires. Barring this, connect the unit positive to the positive terminal of the starter solenoid, and the ground to the battery. I just have a preference to keep wires off the battery positive terminal. Should you use this RR, you could remove the old wiring to the RR. Make sure you cap the red/white wires as these will be live at all times. Hi Ernest. I like the looks of that new stator. It looks so "simple". I see that new RR has only 5 wires coming out. 3 are for the stator and the other 2 are the + and - for the battery as you have shown in the photo. I also see 2 connectors to the left of the RR in the photo. Are they the old connectors that USED to be plugged into the old RR?. What did he do with them, just leave them there unconnected? From what your describing, i would need to run NEW wires to the stator AND to the battery, am I correct?, and leave the rest of the wires disconnected but capped or taped off correct? I'm not so sure i can leave all those wires disconnected, I mean, they have to go somewhere don't they?.